The Killer B Motorsport J-Pipe is designed as a Performance replacement for the Restrictive Factory Component. It can be used with the OEM Intermediate Pipe or the Killer B Motorsport Performance Intermediate Pipe. 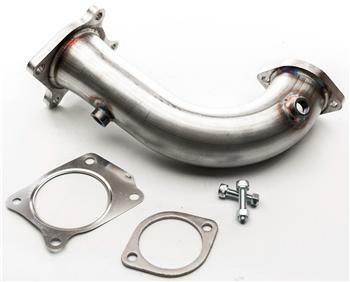 The Killer B Motorsport J-Pipe will provide Faster Turbocharger Spool and Responsiveness. The Free Flowing performance oriented design will Reduce Post Turbo Backpressure providing More Torque and More Horsepower. The Killer B Motorsport J-Pipe is a Performance Enhancing product, a custom tune is required for obtain maximum power potential and engine reliability. As with any Killer B Motorsport products, you can expect Top Quality Materials and craftsmanship.